It’s strange to these ears that 2008’s Do You Like Rock Music? has got more than its fare share of detractors. I’m not just talking about people who don’t rate it, but there are British Sea Power fans out there who seem to genuinely despise the record. Apparently it sounds too much like Coldplay or something. I must have heard a different record. Even though DYLRM? was a much more commercial proposition than BSPs preceding two releases, it still very much contained their essence. However if DYLRM? 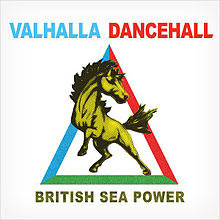 was British Sea Power making a mainstream rock album then Valhalla Dancehall is (at worst) British Sea Power making a British Sea Power album. Which means that (at worst) Valhalla Dancehall is brilliant, eclectic, imaginative and engrossing. Scattered across the running time is glimpses of all that we’ve heard of BSP over the past 10 years. The earsplitting post-punk of ‘Thin Black Sail’ echoes ‘Apologies To Insect Life’ in its lightning quickness and howling guitars. Only this time rather than introducing the record it finds itself between two glacial experimental pieces in the final third. It’s all that stands between the hypnotic wonder of ‘Cleaning Out The Rooms’ (the only track to return from last years Zeus EP) and the 11plus minute stunner ‘Once More Now’. The viola of new member Abi Fry and the firm drumming of Wood are all that punctuate the backing drones that sound to be made from ghostly sighs, gurgling synthesizers and field recordings of howling winds. Like the stretches of The Suburbs that allow themselves to fade into the subconscious ‘Once More Now’ doesn’t always demand yr direct attention. The stabs and moments that jar the awareness serve to show how special a composition it is. Luckily for those of you with short attention spans, British Sea Power haven’t forgotten their pop chops or their ability to write a crazy anthem. Valhalla Dancehall opens with ‘Who’s In Control?’, a perfectly timed clarion call questioning the power of authority. It’s drawing comparisons across the board to early Manic Street Preachers, for good reason. ‘Stunde Null’ is a personal favourite that shreds through snare drums in a blast of barely controlled chaos. It forms one of a perfect pair with ‘Mongk II’ in a front half that’s completely contrary to the glacial pace towards the end. ‘Mongk II’ is a cut from Zeus (originally called 'Mongk') that’s been newly and completely flashed out. A Motorik beat keeps in check the shooegazy noise of the guitars whilst the vocal bears slight inflictions of a vocoder. It’s a very distant relative of the excellent ‘No Lucifer’ and houses possibly the best moment on a very fine album. After a brief subsidence in the noise a slight break in the beat heightens the return of the guitars an a squall of feedback. When listening to it on headphones it forces a blink. It’s that loud. It’s that good. Earning points for un-obvious choice of single ‘Living Is So Easy’ is hidden towards the end of the record and has been sited as British Sea Powers electro-pop song. Whilst it’s true that it features a rare use of synthesisers by the band, it comes across as an attempt as such by some people that have never heard anything from the 1980’s. This is meant as a compliment, obviously. The strange bubbling and observatory angle make this a much braver single than the still excellent (but predictably BSP) ‘We Are Sound’ which it can’t help but be felt that any lesser band would have lead with. Closer ‘Heavy Water’ is deserving of mention for bringing proceedings to a stately close. After the contrasting chaos and dreamlike states it’s a calming and epic closer. It’s also the most notable instance of the influence Pulp have had on the band. The lushness of the sound and crispness of the drumming brings to mind the Sheffield legends swansong We Love Life in all of the right ways. That British Sea Power exist is enough for me and this is another album which simply confirms their status as one of the very best bands in the world. Valhalla Dancehall is a complete, immersive, strikingly intelligent, evocative and brilliant rock album. If there’s one band operating anywhere near the mainstream that signify what rock music can mean in the 21st Century then it is British Sea Power. Highest praise for a band of the highest order. Happy New Year Pop Fans!